A discreet pull up designed for heavy bladder weakness and faecal incontinence. Features a breathable back sheet and a flexible fit. 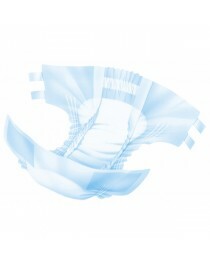 This Attends Pull Ons 8 incontinence product is available in a medium size. They provide for bladder weakness and faecal incontinence on a heavy level. They look like real underpants but have a long absorbent strip down the centre from front to back for collection of any accidents. The Attends Pull Ons 8 can be worn instead of underpants as they provide for full coverage. They have an elasticized waistband, and elasticized leg holes with frilly gathering. They are in a white and light blue colour. There is a breathable back sheet so that the skin can breathe and not get sweaty. The Attends Pull Ons also have a nice flexible fit that moves with you, but that still keeps fluids trapped in. They are naturally designed to conform to the shape of the body. There is an absorbent core that will help to keep fluids in. The additional benefits of Attends Pull Ons include their elasticized legs that provide a second level of protection. This is a discreet pull up that is best for patients who still retain some mobility and can change their own diapers or who need minimal assistance. Otherwise, one of the other Attends incontinence pads may be best. The Attends Pull Ons 8 is available in other sizes if the Medium size won’t fit you: Small, Medium, Large, and Extra Large. There are two detachable side panels to assist in the placement and the removal of the underwear. The Attends Pull Ons 8 are distinct enough that the caregiver can easily find them in a laundry basket of clothing, so they don’t get tossed in the washing machine. The Attends are meant to be disposable. They don’t need to be immediately replaced after soiling, as their absorbency has been designed to wick moisture away from the skin and keep it deep within the confines of the fabric. The patient will stay clean and dry. These Attends pants also work to protect the escape of odour, so that not only is the dignity of the patient maintained, but the natural fibres help to prevent the growth of bacteria that can lead to skin infection. The Attends Pull Ons 8 come in a pack of 16. Their absorbency is to 2099 ml. • Easy to pull on and off.